Our mission is to inspire the kids and parents that come through our program. By building trusting relationships, together we encourage learning and passion for the game of soccer. With every success and failure we look to ourselves to see how to put the best product out on the field. Our fun and safe environment allows kids to explore their imagination and learn how to live a healthy, active lifestyle. We concentrate on the experience and that each child leaves with a smile on their face. We applaud effort and strive for greatness. Our responsibility is to help the kids that come through our program grow not only into great soccer players but even better human beings. We do this through our program. Our goal is to positively impact the world. 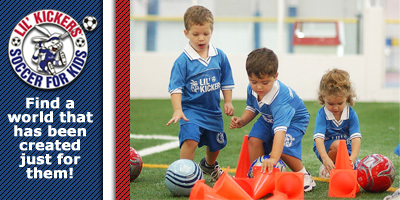 From the children who attend our classes and the parents who enroll them; from the coaches who teach the classes to the coordinators who organize them, we hope to help others fulfill their missions by living ours through the Lil’ Kickers program, and through its relationships to our community at large.